MONITORING SERVICE IN THE WORLD. Recording of the surface ECG continues to be the most useful examination for documenting symptomatic disorders of the heartbeat and is often followed by 24/48 hour or Extended Monitoring. Certain clinical situations may require extended monitoring as a first choice. Often the clinician relies on a symptom and rhythm correlation to make decisions about patient care. Only with the AdvanceBiometrix Clarus-40 are patients enabled to time stamp their symptoms but also easily insert an event description that populates into the report. This advance in a usable patient interface is without peer. A paper diary is burdensome. The digital drop down diary reduces “busywork ” and allows staff to be more productive. Please ask us about multiple language options. Early Holter technology improved our ability to record the heartbeat but is now outdated and thus redefined. The antiquated conventional technology constricts the process and staff to small numbers of legacy workstations. The inability to leverage cloud technology creates fragility for individual providers as well as large regionalized healthcare systems. 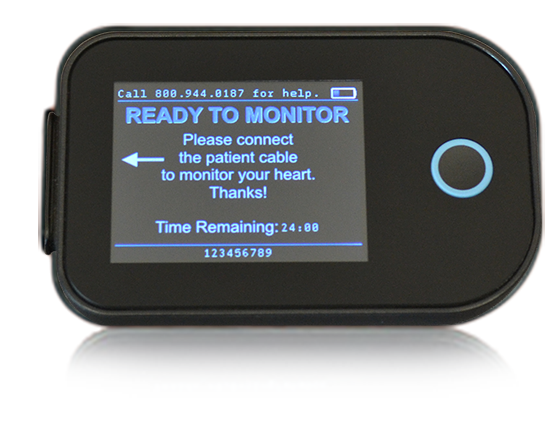 Conventional Holter monitors (if you can find one) remain expensive to own & maintain. They are sold without expectation of a positive revenue cycle from many payors. Poor staff and patient satisfaction remain barriers. There is an incoherent workflow, environmentally wasteful alkaline batteries and the “busywork” of manual diary entry. More patients, less revenue, unnecessary labor expenses and high product acquisition costs are not compatible. Sparse clinic inventory, lost or non-functional devices create disutility by burdening staff to call patients and ask for the device back. Lack of availability creates delays in patient care. Requiring fixed site proprietary workstations is dysfunctional for large widely dispersed organizations. 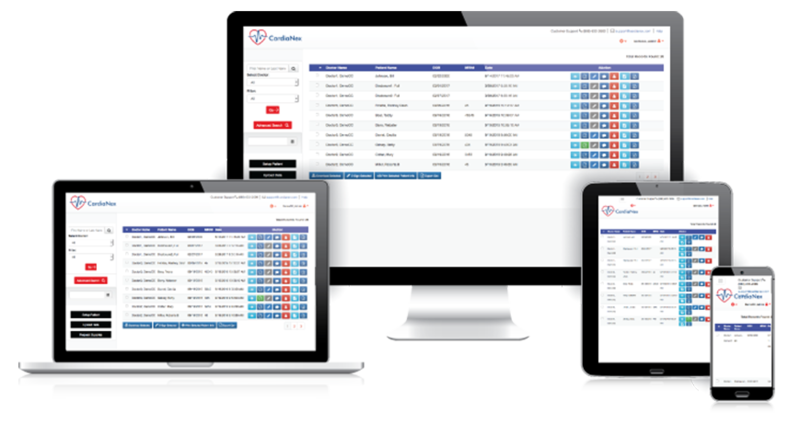 AdvanceBiometrix’s –Clarus is an evolution for your organization easily leveraging staff time for improved patient care and satisfaction. When precise detection of cardiac arrhythmia is necessary to prevent untoward outcomes or unnecessary concern the ability to find those events with adaptable clarity and reliability is now the standard of care. High value low cost healthcare is important for functional and productive clinic workflow. When there is the potential for detection of life threatening cardiac arrhythmia or only a lack of symptom and rhythm correlation required the AdvanceBiometrix Clarus 40 is available abundantly and ready to monitor as long as necessary. The HIPPA compliant and HL-7 compatible cloud-based Physician’s Portal provides a complete view of all patient reports and all current enrollments. View, store and visualize through one portal. Accuracy and cost effectiveness are vital to the the patient experience just as true 3 vector orthogonal recording leads the world in physician satisfaction and specific arrhythmia detection. The ability to remove the monitor for personal activities is a unique way to improve the patient experience. Multi-day monitoring is now considered a best practice. High value low cost health care aligns with an improvement in staff, patient and physician satisfaction. There is no reason to put your clinic at negative financial risk to acquire similar or possibly lower quality information. Our mission is to serve you and your patients while improving access to accurate technology for everyone. Our business model prioritizes this as patient care and satisfaction are best served without predatory or unreasonable billing. We send the devices to you with no upfront capital investment, you will have immediate access to the Physician’s Portal, and you start monitoring for patients within two days. The Clarus 40 is an accurate, high fidelity, reliable, patient centric digital monitor. 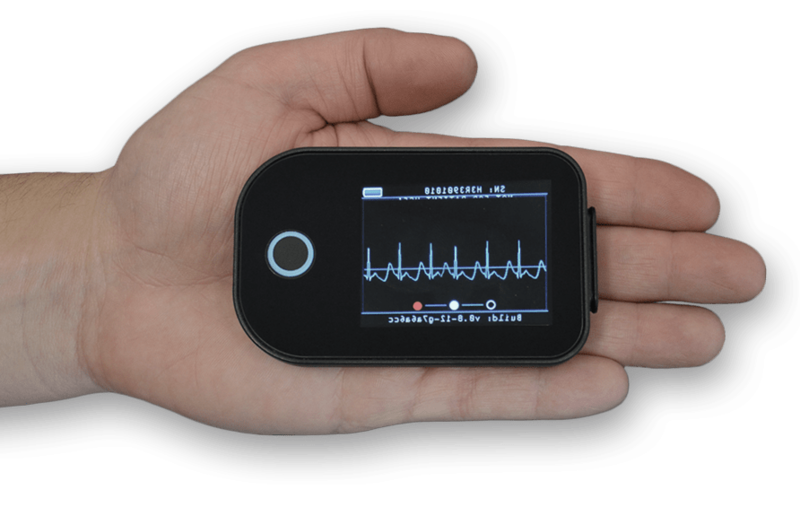 It is capable of recording 3 true surface bipolar channels of patient ECG data using 3, 4, or 5 surface electrodes adhered to the body while operating for up to 5 days of continuous recording. 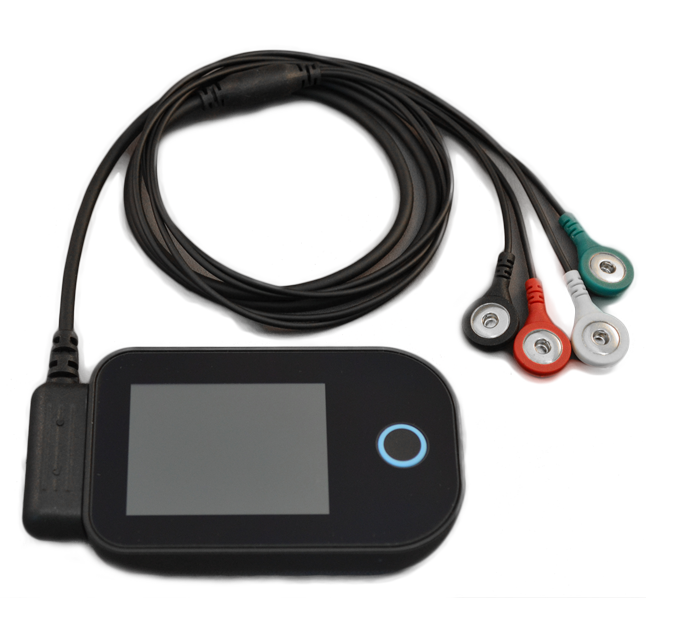 It is a unique type of monitor which can be disconnected easily by the patient for personal activities and reconnected with resumption of recording capability. Fast and simple data retrieval – You connect to any workstation with the provided USB cable and retrieve data at 480 Mbps while charging begins. Multiple ganged USB ports allow for an exceptional clinic work flow allowing multiple units to be charged during morning clinic and then assigned to waiting patients in the afternoon. Clinic workflow improves intuitively. Report turnaround problems a thing of the past. Paper diaries are often illegible and hard to use for many people. Patients learn to use the touch screen quickly and identify symptoms on the drop down screen. This facility is available in multiple languages. The information is sent securely and populated into the report. The device is water resistant with a gorilla glass front making it durable. No more wasting batteries. Clarus 40 uses a rechargeable lithium battery. Multiple units may be charged at once for rapid device clinic turnover. Durable, versatile, easy to wear as it is as easy to upload, the Clarus 40 is your choice for Holter monitoring. accurate and will last the length of the prescribed study. Extended Holter studies greater than 72 hours are possible on a single charge-giving you the best diagnostic yield. Say “goodbye” to paper diaries. 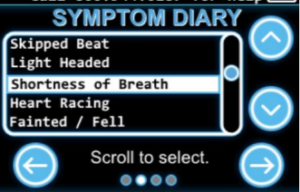 The drop down menu provides an electronic diary matching symptoms with patient’s rhythm. Improving efficiencies and ease of use makes Clarus 40 the natural choice for your Holter monitors. #1. You call one person who is your contact for any issue from supplies to writing off bills. No dealing with extensive phone trees or with dead-end managerial staff. One call and we take care of it so you and your patients are cared for. #2.. We will not harass or otherwise irritate your patients for unanticippated out of network charges. Our staff has decision making authority in the field.